Over the Christmas holidays, we visited the Second Street Market here in Dayton. I saw these little gems in a bin…and they were calling my name. I like brussel sprouts. I’ve liked them all my life. But I’ve never cooked with them. I’d only eaten them from a bag out of the freezer. Cooked, of course. But never had I made them from “fresh” sprouts. Since I wasn’t exactly sure what I was to do with these little green gems, so I searched around. Every where I looked, said to cook them with pancetta or bacon. But I didn’t have any bacon on hand, and well, pancetta is just too pricey for me! So I ended up deciding to work up a pasta. Seemed safe. After all, I didn’t want to screw this up and waste these green little gems. 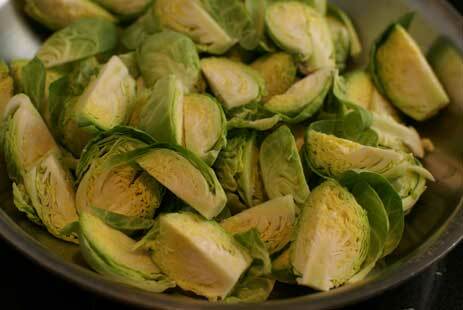 Rinse brussels sprouts and remove any yellow leaves. Chop off the ends and discard. Add to a small skillet with some olive oil and lemon juice. Add salt and pepper to taste and toss. 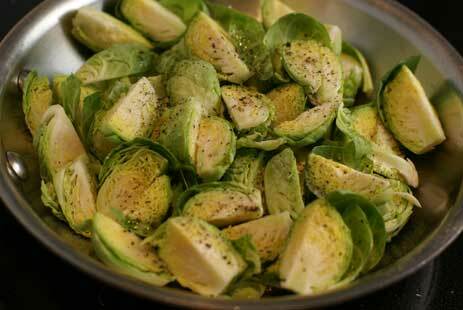 Roast the sprouts in the pan for 4-6 minutes, or until turn golden brown. Set aside. In the same skillet, cook the diced chicken pieces. Toss for 6-8 minutes, or until all chicken pieces have cooked through. Cooking time may vary depending on thickness of the pieces. Meanwhile, cook 2 cups of pasta as directed on package instructions. Once pasta and chicken have cooked, add all to a large bowl and toss with 1/4 cup of lemon juice. Sprinkle with salt and pepper, to taste. Serve by itself, or with a side salad. This looks scrumptious! I love brussels sprouts. If I could get my husband to eat them, I would certainly try this! 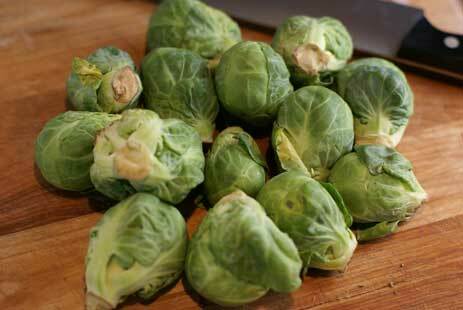 I LOVE fresh brussel sprouts. will not touch the frozen ones. This sounds yummy — will have to try it very soon! So delicious!! I absolutely love roasted brussel sprouts. The nutty flavor is amazing! This is is a winner Erin. So how was it? 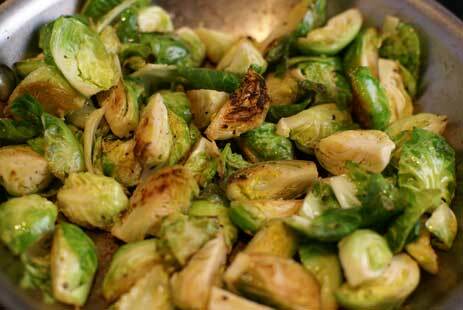 I have never been a fan of brussels sprouts, but this actually looks pretty good! I loved it…didn’t seem “brussels sprout-y” at all! You would love Brussels Sprouts Au Gratin…oh my word are they good! This is my new favorite blog. This recipe looks terrific! Thanks. That looks really fantastic! 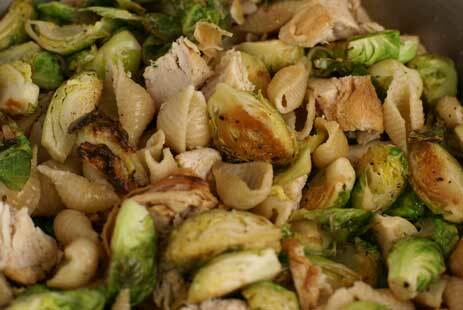 I love brussel sprouts but you don’t often see good recipes for them, so thank you! I’m so glad you posted this recipe. I have 3 stocks of brussel sprouts in my garden right now. Seems like I’ve been waiting forever to harvest them but when I do I will certainly be making this dish. It looks delicious! 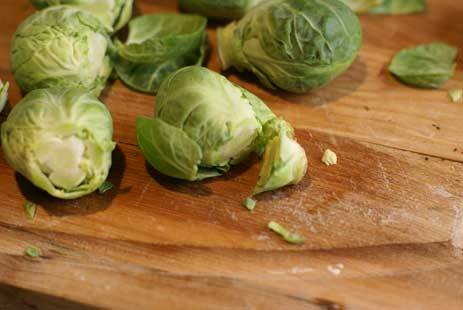 Funny how many have never cooked fresh brussels sprouts – I’ve never had frozen! We often do them to go with steaks or roast beef. Excellent with cheese sauce. 1. buy them all the same size so they cook at the same speed. 2. after you trim the flat bottom, cut an X in it to speed cooking of the dense core. The core cooks more slowly than the leaves and you don’t them to turn to mush while you wait for the core to cook. Mmmm looks good! I received my “everyday cheapskate” email today and your recipes were featured!! Keep up the great work. Any news on a DC/Baltimore cookbook signing?